This will allow us to determine periods and amplitudes, and measure accurate mean Ks magnitudes. We will construct the Bailey diagram (luminosity amplitude vs. period), and interpret the results of the variability analysis in terms of stellar pulsation and evolution models, similarly to what is currently done using (primarily) the visual bandpasses (e.g., Bono et al., 2000, 2007; Marconi et al., 2003; Cacciari et al., 2005; Marconi & Degl’Innocenti, 2007). As pointed out by Bono et al. (2000), one common limitation in the comparison between hydrodynamical pulsation models and the observations is the lack of proper sampling in the available near-IR light curves – a situation which will be dramatically improved with the advent of the well-sampled Ks-band light curves from the VVV survey. Naturally, while RR Lyrae stars are the main focus of this project, similar such studies will be possible for many other types of variable stars, provided they are detected in significant numbers in our studied fields – including, for instance, classical Cepheids (Fiorentino et al., 2007), type II Cepheids (Di Criscienzo et al., 2007), anomalous Cepheids (Fiorentino et al., 2006), and Miras and semiregular variables (Kerschbaum et al., 2006; Smith et al., 2006), among others — with a significant impact also upon their use as distance indicators. The pulsation properties of bulge variables will be compared with those of similar variables in the halo and nearby dwarf galaxies (e.g., Catelan, 2009). 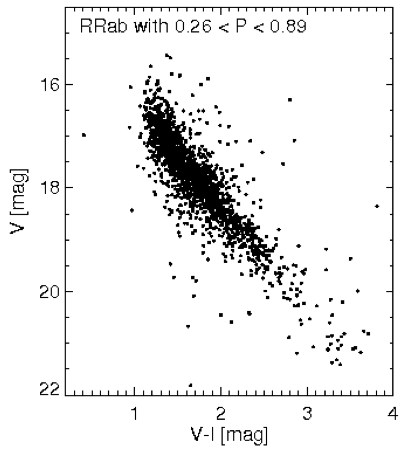 The distances measured and RR Lyrae counts can be compared with the red-clump giants, which are excellent tracers of the inner bar (Stanek et al., 1994). This would define the geometry of the inner bar and of additional structures (such as a potential second bar; Nishiyama et al., 2005), and explore the radial dependence of the density (e.g., Minniti et al., 1999), or trends with Galactic latitude-longitude, to finally unveil the structure of the bulge. The microlensing surveys that we have been involved in (OGLE and MACHO) have discovered a small fraction of the bulge RR Lyrae stars (e.g., Fig. 1, see Alcock et al., 1998; Wozniak et al., 2002). Our survey will increase the amount of data on bulge RR Lyrae significantly. We will search for RR Lyrae and type II Cepheids in the Galactic bulge to reveal the presence of any debris related to accretion events that might have left behind the present-day globular cluster NGC 6441. This globular cluster is well known to contain an anomalous RR Lyrae population, with periods that are much longer than those of known field RR Lyrae stars of similarly high metallicity (e.g.,Pritzl et al., 2000, 2003). 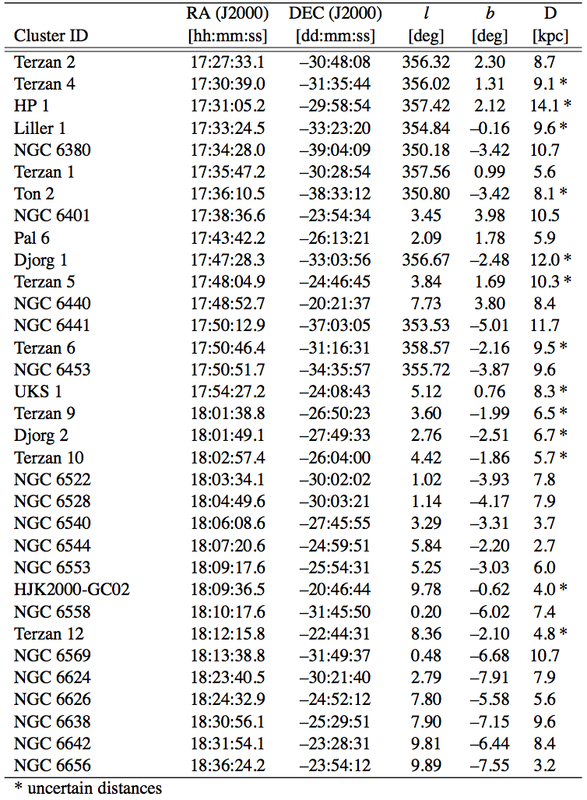 In particular, the presence of the unusually long-period (P > 0.45 d) RRc (first overtone) variables, which have so far not been found in the general field but are present in large numbers in this globular cluster (e.g., Catelan, 2004a), should provide the smoking gun for the presence of NGC 6441- related debris in the general bulge field. In a similar vein, long-period RRab stars (fundamental-mode pulsators) occupying the appropriate position in the period-amplitude diagram should also provide us with a strong indication of prior membership of such a protogalactic fragment. 2. To identify variable stars belonging to known star clusters. There are 33 globular clusters and 355 open clusters located in the VVV area (Fig. 2), which may contain RR Lyrae, type I and II Cepheids, semiregular variables, and eclipsing binaries, among other types of variables. Distances, reddening values, metallicities, and horizontal-branch (HB) types will be obtained for these clusters from a homogeneous dataset (e.g., Catelan et al., 2006; Zoccali et al., 2003). In some favourable cases, ages can be derived. Table 3 lists the globular clusters that will be covered, giving positions in equatorial and Galactic coordinates, and distances from the Sun. The asterisks in the last column indicate that more than one third of these clusters have uncertain distances. We will improve the distances for these globulars, and confirm the previous estimates for the rest of the open and globular cluster sample. Figure 2: Map of the globular and open cluster positions (full and empty circles, respectively) towards the Milky Way bulge and plane. Included in the VVV area are the 33 globular clusters listed in Table 3 (Harris, 1996), and 355 open clusters (Bica et al., 2003; Dutra et al., 2003; Dias et al., 2006). The bulge contours are indicated. Table 1: The 33 known globular clusters within the VVV area on 2010. For some of the Cepheids which we expect to find in open clusters, we will derive improved distances by applying the IR surface-brightness technique (Gieren et al., 2005; Fouque & Gieren, 1997) on these variables. 3. To find eclipsing binaries in large numbers. We expect to detect more than 5 × 10∧5 binaries, an unprecedented database that will allow us to determine periods, amplitudes, mean magnitudes, study stellar properties, and also select extrasolar planetary-transit candidates. In particular, YY Gem-like systems can be identified to constrain the lower main-sequence parameters (e.g., Torres & Ribas, 2002), and selected transit fields can be followed frequently to identify and measure extrasolar giant planets (Udalski et al., 2002). 4. To find rare variable sources. The massive variability dataset and multi-colour atlas will allow us to search for CVs (novae, dwarf novae) and other eruptive variables (e.g., RS CVn), eclipsing binary RR Lyrae, pre-HB/post He-flash stars (Silva Aguirre et al., 2008), eclipsing binary red-clump giants, luminous blue variables (LBVs), FU Ori protostars undergoing unstable accretion, and asymptotic giant branch (AGB) stars at the stage of unstable shell burning. The Murchison Widefield Array (Lonsdale et al., 2009) will soon open up the field of surveys of radio transients in the southern hemisphere, likely making infrared variability surveys of the southern part of the Galaxy interesting for interpreting their results. The Galactic center region contains numerous high energy sources without counterparts in the optical/infrared band, with continuing discoveries coming both from space- based X-ray and γ−ray observatories and from ground-based Cerenkov arrays. The most sensitive of these observatories, the Chandra X-ray Observatory, has discovered almost 104 X-ray sources within a 2 × 0.8 deg2 region near the Galactic center (Muno et al., 2009). The Chandra Galactic Bulge Survey (Bassa et al., 2008) contains about 10³ X-ray sources spread over a larger, slightly less crowded region, and already has deep optical follow-up. These objects are often extincted enough that they cannot be observed in the optical, but there are also often multiple in-rared counterparts found even in moderately deep infrared images within the 1” or smaller Chandra error regions (e.g., Gosling et al., 2007). For γ-ray sources, such as those which have been found with INTEGRAL (e.g., Kuulkers et al., 2006; Bird et al., 2007) and HESS (Aharonian et al., 2007; Chaves et al., 2008), the point source localization is even poorer – typically several arcminutes. Fortunately, X- ray binaries are usually variable, and their variability in infrared and X-rays is, for the most part, well correlated (e.g., Russell et al., 2006). As a result an infrared variability survey of the inner Galaxy can be combined with the ongoing monitoring in X-rays and γ-rays from missions like Swift and MAXI, should give the opportunity to search narrow down the list of candidate infrared counterparts through searches for IR emitters with variability well correlated with that in the high energy bands. 5. To search for microlensing event. Specially reddened events, short time-scale events, and high magnification events in obscured high-density fields. The spatial dependence of the microlensing optical depth τ at near-infrared wavelengths has been modelled by Kerins et al. (2009) using synthetic population synthesis models of the Galactic disk and bulge. The spatial variation of τ can probe directly the mass distribution contained in the inner regions. Unfortunately, current optical microlensing searches do not cover the whole bulge or the plane due to the prevalence of dust. In particular, they miss the inner regions of the bulge where the optical depth is higher, providing poor constraints to current models (Bissantz & Gerhard, 2002; Bissantz et al., 2004). At near-IR wavelengths a map of microlensing optical depth for the whole bulge can be made, allowing a search for asymmetries in the spatial distribution of τ. The strength of the microlensing asymmetry is a function of the orientation of the inner bar as well as the relative contributions of the bulge and disk to the microlensing rate. A near-IR microlensing sample can therefore provide an important additional lever on the 3D geometry of the inner Galaxy. In addition, we expect to detect microlensing of stars in the Sgr dSph galaxy (e.g., Popowski et al., 2005). An area of 1.5 deg² around the Galactic center including the 180 pc Nuclear Ring (Messineo et al., 2002) will be the most frequently monitored field, over a total of 200 epochs spanning five years. Expected variability due to high-magnification microlensing, or flares due to black-hole accretion, can occur (e.g., Chaname et al., 2001). Black-hole flares easily reach Ks∼16 mag, with a typical duration of 10–30 min. The expected flare rate is 2–6 per day (Genzel et al., 2003; Eisenhauer et al., 2005), in addition to a longer-timescale variation predicted by accretion simulations (Cuadra et al., 2006). We also expect some Wolf-Rayet variability in the population of massive stars and clusters in this region, and we will search for eclipsing WR stars. In addition, we will be able to identify the counterparts of high-energy (γ-, and X-ray) sources: accreting black holes, microquasars, binary-pulsar companions, low mass X-ray binaries (LMXBs), and high mass X-ray binaries (HMXBs) (e.g., Mirabel & Rodrıguez, 1998; Lucas et al., 2008). In particular, this survey may reveal the as yet undetected counterparts of the most luminous, persistent hard X- ray/jet sources in the Galactic center region, 1E 1740.7-2942 (Mirabel et al., 1992) and GRS 1758-258 (Rodriguez et al., 1992). Our survey will allow us to identify and monitor the counterparts of several variable high-energy sources, and perhaps in some cases to determine their orbital periods. 7. To search for new star clusters of different ages and identify their variable star members. Such as Cepheids, semiregular variables, W UMa-, and δ Sct-type stars. The asymmetric distribution of the known globulars in the Galactic center region hints at the presence of additional, as yet undiscovered objects (Ivanov et al., 2005; Kurtev et al., 2008). Our team members have already carried out successful campaigns searching for new clusters in the 2MASS Point Source Catalogue (Ivanov et al., 2002; Borissova et al., 2003; Dutra et al., 2003). Note that 2MASS, with a Ks, lim = 14.5 mag in the bulge, discovered hundreds of open cluster candidates, as well as two new globular clusters. Because we will reach 3 − 4 mag deeper, we expect to find many new clusters. We will build a homogeneous sample of at least 300 open clusters in the direction of the Galactic center, with accurately derived fundamental parameters. A sample thus obtained will be useful to investigate the structure of the Galactic disk in directions intercepting the bulge. This will represent a major improvement over our current knowledge in this area, since only 20 clusters have so far been studied in detail in this region of the sky, according to the last update (ver. 2.10, 2009) of Dias’ catalogue of Galactic Open Clusters (Dias et al., 2002). We will carry out a census of the Milky Way open clusters projected onto the central parts of the Galaxy. This will allow us to establish the fraction of star clusters compared to statistical fluctuations of the dense stellar field in those directions, as well as the cluster-formation efficiency relative to field stars. We can also estimate the role of disruption effects on timescales < 10 Myr (particularly useful for open clusters). We will derive the physical parameters: angular sizes, radial velocities, reddening, distances, masses, and ages of these clusters. Reliable fundamental parameters of unstudied open clusters are important both to disk studies and to constrain the theories of molecular-cloud fragmentation, star formation, as well as stellar and dynamical evolution. We will trace the structure of the Galactic disk. Recent studies of the disk structure based on open clusters are complete up to only 1 kpc from the Sun. We will complement and re-derive the existing kinematics distributions such as distance of the cluster to the Galactic center vs. age distribution, open clusters age histogram, distance of the open clusters to the Sun vs. reddening, etc. GLIMPSE-II, VPHAS+, MACHO, OGLE, EROS, MOA, Pan-STARRS1, and PLANET. Near-IR photometry is important for the events discovered by microlensing surveys. For old previously detected events or new ones, the VVV survey will give field reddening, a baseline colour, and a magnitude that can immediately be translated into temperature and luminosity for the source star. Characterization of the source is essential for refining the microlensing light-curve parameters and the physical lens properties (e.g., Beaulieu et al., 2006). Figure 1 shows that the Sgr dSPh RR Lyrae are well within reach and can be readily identified. RR Lyrae would give the 3-D structure of the Sgr dSph (e.g., Alard, 1996; Alcock et al., 1998). To measure the depth and the tilt of the Sgr dSph along the line of sight, mean RR Lyrae magnitudes with an accuracy better than 0.01 mag are necessary. This corresponds to the tidal radius of M54, supposedly the core of the Sgr dSph galaxy (Monaco et al., 2004). We will also detect and measure carbon stars, semiregulars, and eclipsing binary members of the Sgr dwarf galaxy (type II Cepheids are expected in the bulge, but classical Cepheids are not; since these would be found in the disk instead). This goal links the — seemingly unrelated — intrinsically faintest and brightest objects in the Universe. On the faint end, we would use proper motions to find nearby late M-type stars, brown dwarfs (L and T types), and high-velocity halo stars. The proper motions of the most interesting low-mass objects will be determined using UKIDSS, DENIS, and 2MASS to extend the time baseline, and to search for objects with smaller proper motions. With an astrometric accuracy of ∼ 10 mas, comparable to UKIDSS (e.g., Lodieu et al., 2007; Deacon et al., 2009), or slightly lower in the most crowded regions, we will be able to determine this proper motions (Lucas et al., 2008). Scaling the results of the UKIDSS proper motion studies we expect an accuracy of 15 miliarcs yr−1. This is beyond the minimum value to distinguish bulge and disk populations, since the proper mo- tion difference between them is ∼ 6 miliarcs yr−1 in the galactic center region (Clarkson et al., 2008). On the intrinsically bright end, variability would also allow us to identify background quasars, providing an extragalactic reference scale for future proper motions (e.g., Piatek et al., 2005). QSOs have a relatively broad colour range depending on their redshift, and their intrinsic variability increases monotonically with increasing time lags (de Vries et al., 2005). Their amplitudes should be > 0.2 mag in the near-IR (Enya et al., 2002). We estimate that we will find > 500 active galactic nuclei (AGNs), assuming a surface density of 2 deg−2 with Ks < 15.5 mag (Leipski et al., 2005) in the regions above and below the disk where AK < 0.5 mag. Neither the duration of pre-MS evolution as a function of mass nor the duration of active star formation in molecular clouds are well established. IR studies (e.g. Carpenter et al., 2001) have shown that a large fraction of all pre-MS stars are variable over a wide range in absolute magnitude, therefore, the identification of young stellar objects (YSOs) via a variable survey is a suitable method to detect YSOs due to its independence on color. VVV will be capable of picking out loose associations of pre-MS stars in crowded fields long after the molecular cloud has dispersed and the cluster has become unbound. Through careful analysis of the detection rate of such dispersed pre-MS populations and comparison with the detection rate of pre-MS accretion disks with Spitzer and WISE it will be possible to determine the relative durations of the phases with and without a disk. Two such rare pre-MS variables, KH 15D and V1648 Ori, have been described by Herbst et al. (2002); Kusakabe et al. (2005) and Reipurth & Aspin (2004).